Nottingham is not often the first destination that comes to mind when considering a weekend escape from London. This capital of the Midlands is urban, industrial, and known locally more for its university and large shopping district than for its tourist attractions. However, Nottingham is just a few minutes away from the Peak District, a number of beautiful country manors, and the place that gave the city its fame, Sherwood Forest. Robin Hood at Nottingham Castle. Photo by Erin Connelly. 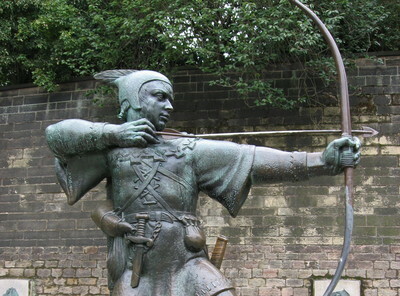 Nottingham City has made much of its connections to the medieval hero, Robin Hood. The legendary figure is particularly linked to the castle and adjoining medieval pubs. Nottingham Castle is carved into a high limestone hill that overlooks the sprawling modern city. The original medieval castle was replaced in the 17th century and currently functions as a sort of Victorian museum. The interior of the castle does not retain much of historical or aesthetic interest, but the exterior is worth a walk around. Nottingham Castle just visible on the hill top. Photo by Erin Connelly. The castle is surrounded by various listed buildings, including 'Ye Olde Trip to Jerusalem Inn', which claims to be the oldest pub in England. Built in 1189, this pub would have been a stop for soliders on their way to the crusades. The Inn is built into the side of the soft limestone hill that supports Nottingham Castle and is composed of a series of caves, much as it would have been during medieval times. The pub offers traditional English fare, which is actually quite good and reasonably priced. The site also has a number of antique pieces of intrigue, including a 'pregnancy chair' and a 'cursed galleon ship'. Ye Olde Trip to Jerusalem at twilight. Photo by Erin Connelly. Nottingham sits on top of a labryinth of hand-carved limestone caves. These caves housed the first settlers, were places of business for medieval tanners and smiths, served as mass graves for victims of the black death, provided shelter during World War II air raids, and were exit routes from the castle during periods of conflict. If you have time, cave tours, as well as historical re-enactments, are available. Caves by Nottingham Castle. Photo by Erin Connelly. Visiting the sites of Nottingham connected with Robin Hood should only take half a day or so, which leaves you plenty of time to visit Sherwood Forest. Only 450 acres remain of what was once a vast woodland that covered most of the Midlands. Of course, the point of visiting the forest is not so much for a walk in nature, but to follow the trail of Robin Hood. On most days, Robin Hood and his merry men wander through the forest interacting with visitors and challenging them to impromptu sword fights. These characters, and the Robin Hood Festival held during the summer, are especially popular with children. The Major Oak. Photo by Erin Connelly. The Major Oak is the most famous tree in Sherwood Forest and was once voted 'Britain's favourite tree'. According to legend, this 800-year old tree was the meeting place for Robin and his men, as well as the hiding place for Charles I at the onset of the English Civil War. The massive tree is still healthy and growing, but has been supported by scaffolding for many years due to its great age and size. Only a short train journey from London, a trip to Nottingham and the nearby Sherwood Forest is an exciting day out for those who love English history and the legend of Robin Hood. A day trip to Nottingham is particularly well-suited to families with young children, who will enjoy the Robin Hood-themed characters and variety of children's activities provided at Sherwood Forest. Sherwood after a rainstorm. Photo by Erin Connelly. Why? Follow the legend of Robin Hood from Nottingham Castle to Sherwood Forest. Cost: Free. Some fees may apply for castle or cave tours.